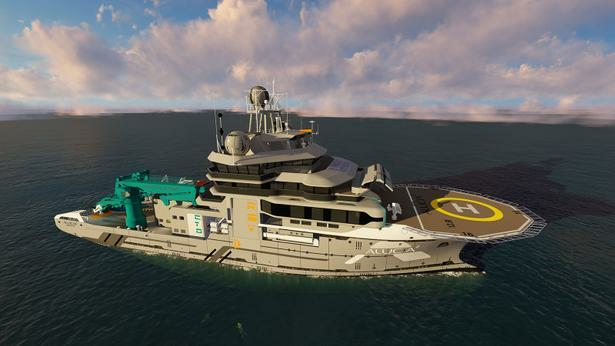 The FarSounder-1000 Forward Looking Sonar (FLS), has been selected by the OceanX exploration team to help provide safe passage for Alucia2, its new 85.3m research and exploration yacht. Admarel BV, a member of the Alewijnse Group, is the FarSounder dealer in the Netherlands instrumental in securing this sale. With the inclusion of a FarSounder-1000, operators of the vessel will be able to view a true underwater 3D image ahead of the ship up to 1000 meters range. The sonar's technology is designed to assist in the prevention of collisions and groundings as the OceanX team explores parts unknown. The Alucia2 is a major refit project transforming the former Volstad Surveyor built in 2010 by Freire Shipyard. Advanced wet and dry marine research labs as well as a media and production center, suitable for professional-grade film production are some of its innovative features. Principals involved with OceanX include Ray Dalio and his son Mark Dalio, along with famed director James Cameron. Southampton marine technology firm Azurtane is developing an advanced vessel positioning system.Working in conjunction with Red Funnel, the Isle of Wight ferry company, first trials are set to begin on the ferry operator’s high-speed craft RedJet7 in late April 2019.